Beautiful girls are present in all parts of the world. In pageants too, girls from different parts of the world get appreciated. It is always particularly good to see girls from remote places of Africa making it big in pageants. These beauties are exotic, graceful and stunningly modern in a good way. 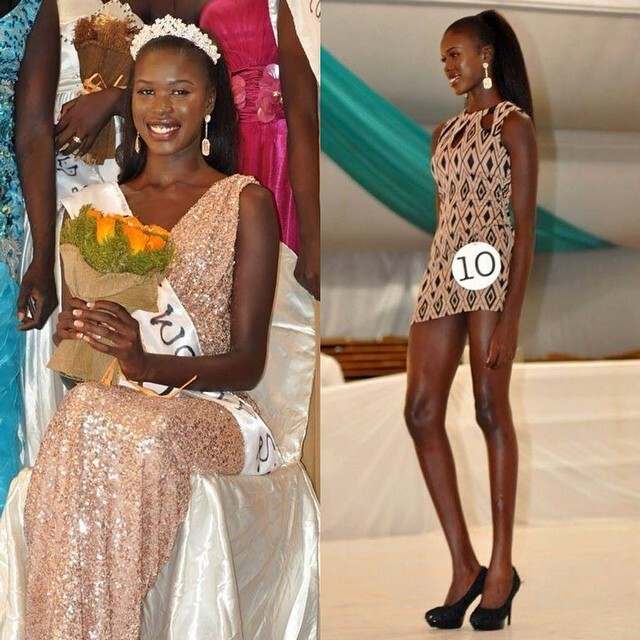 Eunice Onyango of Kenya won the second runner-up title in Miss International 2015. She also won the title of Miss International Africa. It was the first time a black African beauty made it to the Top 3 of Miss International. It is the first time a bald beauty placed in the Top 3 of this pageant with a rather traditional taste. Eunice Onyango actually left no option with the judges. She is supermodel-esque, gorgeous, smart, well-spoken and very confident. Her speech in the finals was very impressive. This is one of the highest placements of Kenya in pageantry ever. This success is particularly special because Miss International is often accused of racism. However, after Eunice Onyango’s success, perhaps more African beauties can dream of wearing the coveted Miss International title someday. South Sudan started sending contestants to Miss World pageant from the year 2012. And every year, they are sending wonderful girls. Awiyen Kwanyien-Agoth (Wendy) was their choice for the year 2014. The experts of pageants around the world instantly fell in love with the exuberant, youthful & stunning lass. She is tall, lean and looks very classy. She has spent a lot of time in the United States and comes across as a very smart and intelligent person. She made a very strong impression during her Miss World stint. We followed her face-book page and her positive thoughts made us her fans! She is a very bright and positive woman. She finished in the Top 5 of Top Model contest with her lean stature and confident walk. She finished 2nd in the interview round out of the 100+ delegates – this just shows how confident this girl is. With these accomplishments, she managed to crack the Top 25. We would have loved to see her progress further. In any case, she is a wonderful girl and in our opinion, the best black beauty of the year 2014. We feel she should get the chance to represent South Sudan at Miss Universe pageant. She can definitely crack the Top 10. It would be so wonderful to see her in the pageant! Carranzar Naa Okailey Shooter Of Ghana is one of the most beautiful girls to participate in pageants in 2013. She made a very strong impression even before Miss World started, with her introduction video on the official website. It was quite clear that she is very educated, bright and naturally beautiful. She was also a very determined girl. She lived up to everyone’s expectations and placed high in Beach Fashion and Beauty with Purpose fast-track events. Overall she was 10th in score-board when it was last displayed. She wore a blue gown and loved lovely, although we feel there could have been a better gown to adorn this damsel. She gave a very good answer in the final round. Her glittery eyes and shining smile won everyone’s hearts. Although it was clear that Megan Young was winning, still it was very good to see her in the Top 3. We wish she returns in Miss Universe, she can even win the pageant with ease. Atong Demach was the first girl of her country to participate in Miss World and she was so damn good. She did very well in fast-track events and easily made it to the top 7. It was quite easy to see that she was the best girl in the final round. Her confidence and body language in the final round was astonishingly good. In fact if a list is made of girls with best confidence and communication skills of all time, Atong has to be there. It is said that she finished 4th in the most prestigious pageant of the world. She is now the national director of her country and trained the beautiful Manuella Modong in Miss World 2013. Leila Lopes – I remember she created a stir when she won Miss Angola. Everyone noted she is really good, but no one expected her to win. Her presence in top 15 was not surprising. However, it was wonderful to see her do extremely well in the evening gown round. Her classy gown and regal look made her a big hit. In the final round, she gave a good and elegant answer. Her closest competition was Miss Ukraine who gave an equally good answer. But Leila had the support of the Brazilians who cheered her like a home delegate, because she spoke in Portuguese. Her victory was overall a surprise and she turned out to be good, for she was a good Miss Universe. Immediately after her win, she was bashed by Venezuelan national director Osmel Souza for her “not so perfect” body but Leila reverted back to his comment in the most graceful way possible. Emma looks beautiful, although not stunning but very beautiful. She is also highly personable and graceful. She placed in Beach Beauty, Top Model and even Sports fast-track events. Her final answer in the pageant was good. We feel she could have done way better if she was trained very well – like the girls of Venezuela, Puerto Rico & Philippines are groomed. Still, she did extremely well.